Working for a social cause in Stop Hunger Now gives positive energy to Tiki Keh. In just two years, he has outperformed targets to relief hunger among children and needy groups in Malaysia and the Asian community. Corporate Social Responsibility (CSR) has taken root in many companies all over the Asian continent. At Vistage Malaysia, it has gained more depth with the presence of Tiki Keh, President of Stop Hunger Now (SHN) Charitable Association. Tiki is the only Vistage member who is a CEO of a non-profit organisation. He has achieved success in the corporate world and is a fine example of one who is now “giving back” to society. Tiki has had a wide-ranging corporate career in international marketing & sales, corporate branding, event management, process improvement, central planning and logistics management. He has worked with companies like Nylex (M) Bhd, Alcom Bhd, WRP Asia Pacific Sdn Bhd and MIECO Chipboard Bhd. After leaving his last corporate post in Thailand in Year 2012, he decided to join SHN. Tiki reveals that this was not a quantum leap as he has been involved in CSR and social service with his wife, Maple, for the past 10 years. Stop Hunger Now is an international 4-star rated NGO (by Charity Navigator) based in the US which was founded more than 17 years ago. Their mission is to end world hunger in our life-time by providing food and life-changing aid to the world’s most vulnerable communities. These nutritious meals are packed by volunteers from corporate sponsors, civic organizations, educational institutions, faith organizations, etc., at well publicised CSR arena. The meals follow a formula of raw ingredients made of rice, soya or lentils, dehydrated vegetables, vitamins and minerals, a complete nutritious formula to ensure one’s daily need. This CSR exercise engages the sponsors, their staff members, students and public volunteers as they get hands-on at a live event in public venues such as a shopping mall, or at a lobby of a corporate building or at a school hall. It permeates the ‘feel good’ factor in a large crowd and attracts lots of publicity. SHN has approx. 19 branches across the US continent, and with chapters established in India, Italy, Malaysia, Peru, the Philippines and South Africa. Tiki heads the Malaysian chapter which was initiated in August 2012, the second chapter formed outside the US. It is a small outfit with only one full-time staff but aided by many “Super Volunteers”. As Tiki continues to emphasize, the group of loyal volunteers is key to how SHN has grown at such a quick pace! Tiki has his hands full signing up sponsors, sourcing meal ingredients locally at all overseas locations and overseeing the meal packing projects with his wife & his “Super Volunteers”. Although supported by their US parent, the Malaysian affiliate is fully self-sufficient to finance all the meal ingredients, overheads and other expenses. SHN is very much grateful to Vistage Malaysia for helping to get the local chapter off the ground during its initial stage. Richard Wong, Chairman and Chief Listener of Vistage, together with two other Vistage members, Dato’ Jimmy Lim and Datin Suriza Abdullah, sit on the Board of Advisors. 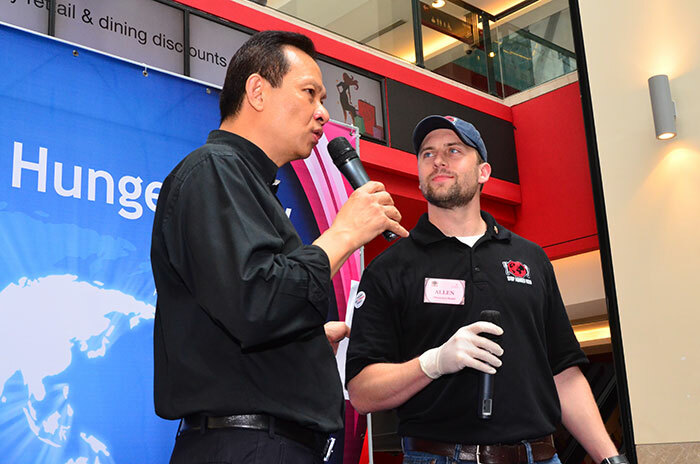 SHN received good publicity at two recent Vistage CEO Annual Conferences and at the Vistage-led 130,000 meals packing project at Publika Shopping Centre, Kuala Lumpur in 2013. “It helped SHN tremendously to gain credibility in the corporate arena,” Tiki acknowledges. As a Vistage member, Tiki has been invited to talk about SHN to various Vistage Groups. This manifested into more meal packing projects in several Vistage groups under their company banner. SHN acknowledges that most corporations need to do CSR, not only to benefit society but also to create an activity for the corporate staff to foster better inter-relationship & teamwork. “They kill two or three birds with one stone, that is to become a good corporate citizen as well as build teamwork spirit and bonding for staff, and a great investment on HR development” notes Tiki. He adds that in the corporate sector, this is most evident in IT-based companies like HP, Google, CISCO and Scandisk. These companies use CSR to attract the Gen X and Y employees who value community service as part of their employment criteria. They “pay” every employee for hours contributed and by allowing employees to do a certain number of hours of community service per month or per year, where the money goes into a fund which is contributed directly to the charity event. From SHN’s experienced, Berjaya Corporation, the Sunway Group and OCBC Bank are strong CSR players in the local scene. They have also worked with corporate sponsors who are multinational as well as civic organizations such as Rotary clubs throughout Asia. To-date, SHN has packed more than 5 million meals since its inception in Yr 2011. It has a list of distribution partners and beneficiaries in Malaysia and Asia who have received the packed meals since then. Among the regular ones are Reach Out Malaysia (street feeding for the homeless in the Klang Valley) , Yayasan Orang Kurang Upaya Kelantan (for the disabled in Kelantan), the Red Cross Society, the Myanmar Refugees children community in Malaysia and the Orang Asli community. What challenges has Tiki faced so far? He says there is a mental block in many potential sponsors who do not believe that hunger issues can be solved by just giving meals. The argument follows the maxim, “Give a man a fish and he eats for one day, teach a man to fish and he can eat everyday”. He responds by saying that the basic physical human need, that is food, must be met first before a human being can “learn to fish”. This is especially vital for young children below five who need the right nutrition so that their brains and physical body can grow to its maximum potential. Studies have shown that undernourished kids are normally stunted at a later age in life and have developed poor motor-skills. This is especially evident in third world countries. In the same perspective, similar studies has proven that young pregnant mothers who have not been properly nourished produce off-springs that are mentally retarded or has some form of physical disability. SHN agrees that it is not possible to end world hunger completely but “every effort counts”. The resourceful Tiki is not letting anything get in the way of his plans to grow SHN in Asia. He has succeeded in spearheading SHN affiliates in the Philippines and India. Next on the list is China and Indonesia. This is an arduous task as SHN has to overcome cultural differences and at times, malpractices by local authorities. In the coming years, SHN sees sustainability in getting sponsors as a challenge. “It calls for creativity to design unique CSR activities and experiences,” he notes.